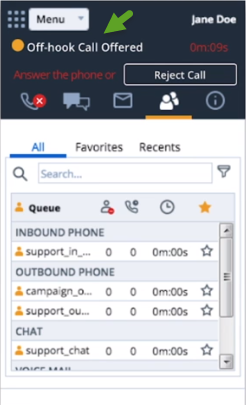 With off-hook connection mode agents can instantly and seamlessly connect to customers and improve their productivity. 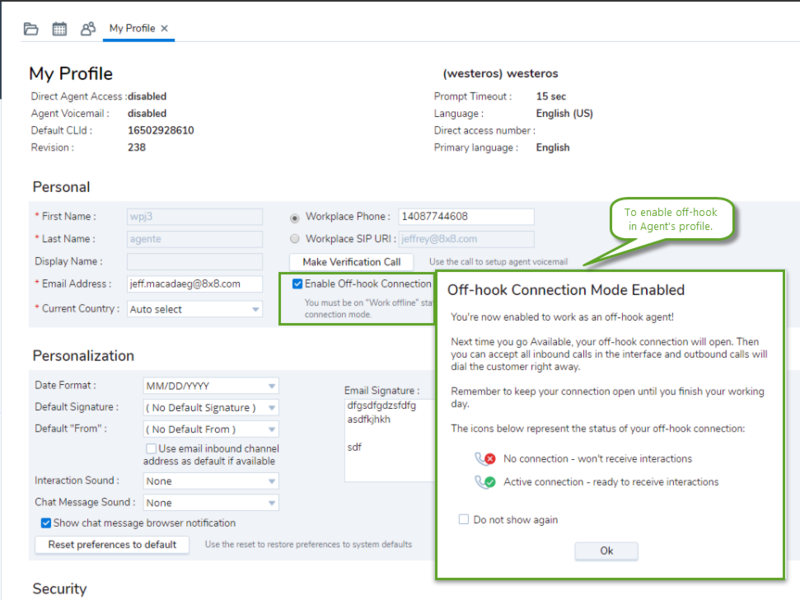 Off-hook is a persistent connection from the agent’s device to Virtual Contact Center. It removes the need to connect the agent’s workplace phone for every call handled. Agents set up their voice connection before they start working on calls and remain connected throughout their working day. This allows them to respond to incoming and outbound phone calls with a simple click on the user interface. In the previous behavior, after agents log in to Virtual Contact Center and make themselves available, they have to accept the interaction for every call that comes through the queue. If they miss the ringing phone, they will no longer be available to take the interaction. 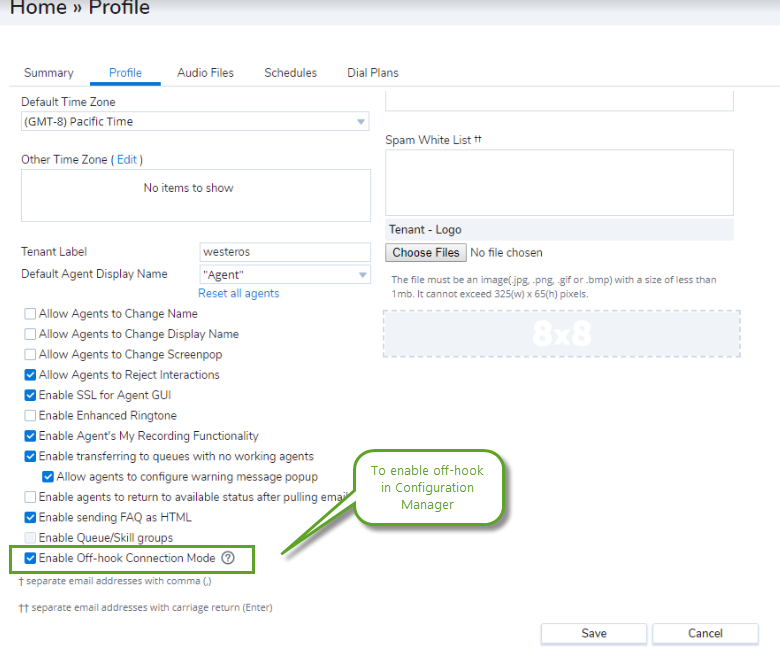 To enable off-hook connection mode for the tenant, log in to Configuration Manager as an administrator and click to Enable Off-hook Connection Mode in Home > Profile. Once it is enabled by administrators, agents can click to Enable Off-hook Connection it in their Agent Console's user profile. Agents can immediately and seamlessly connect to customers. Offers a persistent connection from the agent's device to VCC that is ready for outbound dialing. Removes the need to connect the agent's workplace phone for every call handled. Increased productivity from a higher throughput of calls. Select Enable Off-hook Connection Mode. Off-hook connection is now available for all agents in that tenant. Log in to Agent Console as an agent. While in offline, go to the My Profile page. Select the Enable Off-hook Connection Mode. Once enabled, a message appears showing you how the feature works. Note: This option is available only if it is enabled by the administrator in the Configuration Manager. Click Ok and then Save. Log in to Agent Console. Make sure off-hook is enabled in the agent profile. Off-hook can only be enabled for agents if the administrator has already enabled it for the tenant. Click to change your status to Available. It triggers the outbound call from VCC to agent's workplace phone/SIP. A new status is now offered called Off-hook Call Offered. Answer the call. You hear a personal identification number (PIN). The PIN is randomly generated for each login. Enter the PIN into the authentication box and click Confirm. It opens the agent’s off-hook connection. 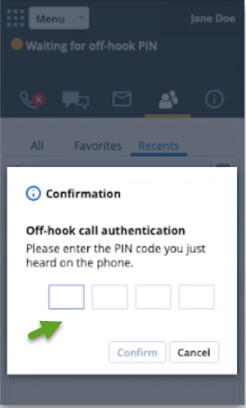 Once the off-hook connection is open, it remains open as long as the agent is logged in. 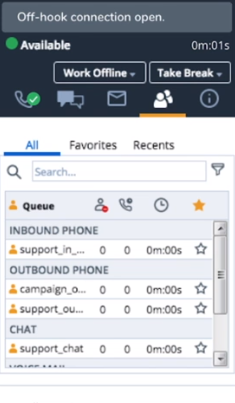 Accept the offered calls to instantly connect to the inbound call, or hear Virtual Contact Center ringing the customer for the outbound calls. Log out to close your connection. A notification appears when the connection is dropped. 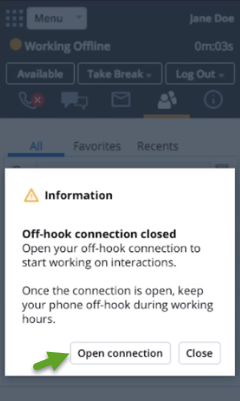 Note: If the connection drops due to an interrupted line or a call being hung up, a notification appears allowing the agent to open the off-hook connection again. Click Open connection to continue.